Only six of the 17 manufacturing PMI readings in the table did not weaken in January, reflecting a broad tendency of manufacturing conditions to ease in the month. In January, five countries saw improvement and one was unchanged. There were also only five countries improving month-to-month in December compared to eight in November. EMU, Germany and Taiwan all showed weakening in each of the three recent months. No country improved in each of the last three months, but the U.S., Mexico, Brazil, India and Turkey improved in two of these three months. Still, 11 of 17 countries weakened in each the last two months. Six of 17 countries logged manufacturing PMI values below 50 in January, pointing to contracting conditions in manufacturing – that’s 35% in contraction mode. Weakness is persisting on a broader timeline as well. 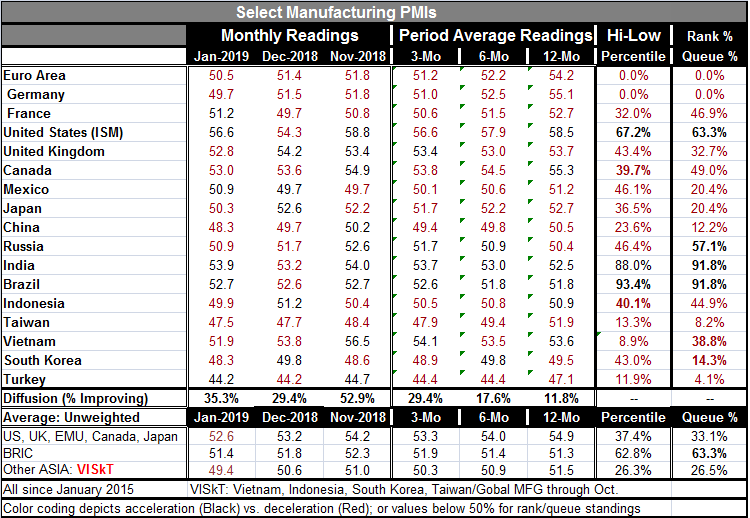 Only five entries in the table show improvements in their PMI three-month average compared to its six-month average. Only four show improvements in their six-month averages compared to their 12-month averages. And only six show improvements in their 12-month averages compared to their 12-month averages of 12-months ago. The broad deterioration in the comparison of average values underscore that this is a real, broad, deterioration that is continuing to spread its misery. This point is further underscored by looking at the rank (or queue) standings of the current PMI values compared to each country’s collection of observations since January 2015. Compared to where these indexes have been over the past four years, India and Brazil have the current highest relative standings with queue rankings in their respective 91.8 percentiles. These rankings attend to PMI values of 53.9 for India and 52.7 for Brazil. In each case, they are the fourth highest reading for these two countries in the past four years (49-months). And that too is telling because those are not especially high diffusion readings; they are just high relative to each nation’s past performance. The U.S. and Russia are the only other countries with queue standings above the 50% mark, which means that only four countries have readings above their medians calculated over the past 49 months. Canada, France and Indonesia come somewhat close. But in the EMU, the EMU reading itself is at its 49-month low as is Germany. Turkey and Taiwan have readings in the lowest 10th percentile of their queues of data. Japan’s reading stands in its 20th percentile; China stands in its 12th percentile. China has been a big drag on global growth as it is under trade sanctions from the U.S. and it is engaged in trade talks with a March deadline for action and a threat of more sanctions if talks fail. On that score, the good news from China is that talks on trade a going well. And China has offered a big step-up in purchases of agricultural goods from the U.S. This is an easy offer since the U.S. is a massive food producer, and China needs to import food stuffs and feeds. But the real important talks are going to be over manufacturing and technology and forced technology transfer as well as piracy cyber theft, the treatment of state owned enterprises (SOEs) and how U.S. firms operating in China will be treated by localities that frequently press them for technology transfer. The Trump Administration also wants real deficit reduction progress; it is not looking for a nice-sounding but empty proclamation. The negotiators have made it clear that they are looking for real accountable and enforceable objectives which is also to say measurable elements of progress on these various fronts. We have all heard and watched the Brexit negotiations. We know that public pronouncements of progress and success can be vastly oversold to the press and the public. Negotiators may feel that it is better to spread feel-good news than feel-bad news even if it is not wholly true. We will not know about the veracity of China’s claim or Mr. Trump’s boasts either until the last minute when a trade deal either will be struck or not. For now concerns are about trade and actual economic slowing that is in train. While the U.S. economy is going better than Europe and most others, its manufacturing PMI still has only a 63rd percentile standing although its 56.6 level towers over everyone else. German in May of last year was the last country in this table to top the U.S. current 56.6 reading. If we rank the table members according to which have had the highest highs in the last 29 months, Germany ranks number one with the U.S. at number two and the EMU area as number 3. France checks in at number 4. It is a clearly a western weighted result. At the bottom on this ranking (the areas with the lowest peak values in the last 49 months), we find South Korea at the bottom, followed by Indonesia, China and Brazil. However, we can also turn this result on its head by asking where has the manufacturing PMI index fallen the most over 12 months? That turns up this list (1) Turkey, (2) Germany, (3) Taiwan, and (4) the euro area. The four least-affected over the last 12 months are (1) India, (2) Brazil, (3) Indonesia, and (4) Russia. Note the prominence of the BRIC countries on the latter list. Asia has been weak for a long time. I sometimes point out that in some circumstances weakness can be an advantage because generally you hurt yourself more falling from a fifth story window than from a basement window. So while Asia has been hurt by trade and the slowdown, there has been more of a negative jolt to the former highly flying countries in the West, especially in Europe. The trade spat with the U.S. has worsened things for China and the U.S. still has other trade disputes, notably one with the EU that is currently out of the lime light and being handed behind the scenes. People make several points about trade and the goods sector that I think we need to understand more clearly. One is that the goods sector is not the largest sector in any economy; services are. The second point is that the services sector employs so many more people than does manufacturing or construction. But the goods sector is the heart of technology progress. And in the case of China, its goal is to dominate tech by 2025 – that is a goods sector goal. China also has a ‘Belt and Road’ program that is a goods sector program about export promotion. China’s view of dominating the future is very much about the goods sector. Manufacturing is an important strike stone for the economy. It can be the hottest spark for growth and burn brightest. It is at the center of innovation. So don’t turn your back on ‘goods’ because ‘services’ are bigger. Services sectors usually are large and they employ more people by far largely because of their poor productivity. But the goods sector is the catalyst for growth. Currently, it is in a down cycle and trade is a big part of the reason for that.